Glaz Tech Industries offers bullet and blast resistant glass products for enhanced glass security and safety applications. Glaz-Tech provides the highest standard of reliability, quality, craftsmanship and service. As bullet and blast resistant glass has become increasingly more advanced over time, Glaz-Tech continues to offer a broad range of glass thicknesses, color schemes, and most importantly weight and improved light transmission characteristics. 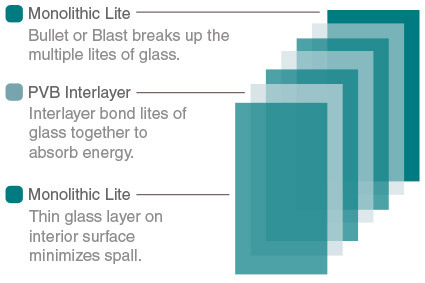 Bullet and blast resistive glass is structured of multiple layers of glass alternated with layers of polycarbonate material or polyvinyl butyral - otherwise known as PVB interlayers. Depending on the desired strength application the sheets of material can reach thickness levels varying between 7 and 75 millimeters (2.95" in). Made to fulfill the needs for special protection requirements, the interlayers of glass are fused together to absorb the tremendous energy that needs to be sustained when a bullet or blast strikes.